This year, there were five individuals nominated for an Oustanding Personal Contribution award that did truly something exceptional, either by saving a life or preventing a serious incident on the railway. The judges felt that to properly recognise this would take a special award to honour those that have gone above and beyond in their everyday duties to change someone’s life. Sunday April 10 2016: Driver Stuart Connell bowling along Norfolk’s Breckland Line at 84mph on the approach to Hockham Road level crossing, near Thetford… when a tractor pulled out on to the crossing. Stuart had seconds to act: he pulled the emergency brake and then left the cab to warn passengers, putting their safety above his own. He also found time to sound the horn to alert the tractor driver and passengers. The train struck the tractor but after the crash, Stuart, having sustained a serious hand injury, did not stop. 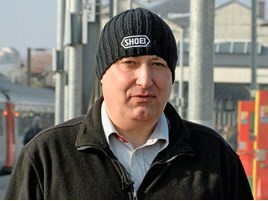 He walked through the train to reassure and look after the 135 passengers. Both passengers and media praised Stuart for his courage and selflessness before the impact and immediately afterwards, with passengers calling him “a hero”. Stuart’s actions were recognised across Abellio Group when he was named “Employee of the Year” its annual Abellio Achievement Awards.